Despite our best to secure our property, if someone wants to break in, they inevitably will do. This is what makes CCTV (closed circuit television) so important, for both your home and business. CCTV is now part of everyday life and is highly recommended by the London Metropolitan Police force as a way to combat crime and protect both your property and family. In the UK there are as many as 2.5 million cameras on everything from cash machines to public transport. The incorrect opinion is that CCTV systems are too expensive and only suitable for luxury homes or big spending businesses. But in fact they’re highly affordable, making them a crucial part of every property’s security. CCTV is proven to reduce crime and people say the presence of this added security makes them feel safer. Just seeing a CCTV camera, even if it’s not switched on, is enough to deter potential burglars from your property. With this added security your property wouldn’t be seen as risk worthy and therefore not a good target for break-ins. With a camera on the premises, residents or workers will feel much safer than without this added measure. With a proven success of deterring criminals it will give peace of mind that both the property and your family are safe from harm. With CCTV you can catch thieves and criminals in the act and ensure a much likelier prosecution. CCTV is the ultimate crime deterrent and many will be instantly put off by the camera’s presence. 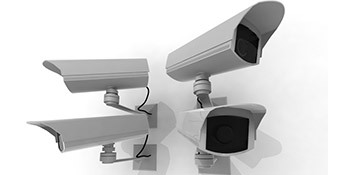 CCTV is becoming increasingly popular in the UK and a cost effective way of deterring crime. If you’re interested in a CCTV system to protect your home, just complete our quick form below and receive up to four FREE quotes from vetted and reputable specialists in your area. Project: Customer visited the mycctvprices.co.uk site and submitted an enquiry. Property type: Semi detached, Required cameras 1-2, Work description: Need a camera at the front and on at the back door. The whole team and indeed experience with this company from start to finish was in my opinion, nothing short of outstanding.excellent ,first point of contact, excellent, price, Excellent, cameras and quality, Excellent,fitting engineers, who were clean, courteous, thoughtful as well as polite. All in all a service of excellence. Very happy, and thank you. We are delighted with the service both over the phone and in person. The fitters were excellent very helpful. The CCTV is brilliant fantastic clear images and easy to use. The price was over £1000 cheaper than another quote. Highly recommend this company. Very quick , very professional and delivered what was promised . Excellent service top quality product great value for money. Took out all the guess work and put us in touch with a reliable provider . We used quotatis to find a cctv installer, within 10 minutes or less from entering our details on the site BW Installations rang , he came to see what the work entailed, within 3 days from the initial enquiry all of the work was finished. brilliant!!!! Properties are given an energy score based on just how efficient they are and ratings are presented in the information underneath. This ranges from A, by far the most energy efficient, to G, the very least efficient. With a higher rating you're more likely to have cheaper energy bills as more heat will probably be retained in your home. You can enhance your home's efficiency with insulation including double glazing, loft lagging or wall cavity insulation. There are many types of home in Britain and the info underneath illustrates the type of houses within Uk. Throughout the country the most popular housing types are typically semi-detached and terraced housing, although detached homes, flats and bungalows are also available. The information beneath offers an indication to the number of households in Uk that are central heated and non-central heated. Households are heated by a variety of sources which indicate how costly yearly energy bills are going to be. Examples of central heating include gas, electricity, oil, solid fuel and LPG boilers. Changing the way your property is heated can see you with cheaper bills. The information below shows the spread of houses heated by different fuels. Throughout the United Kingdom the most common undoubtedly are gas heated homes, followed by electricity and then oil. Biomass central heating boilers are also rising in popularity, heated by eco-friendly products such as wooden pellets or agricultural waste.|Properties in Britain are heated by a number of fuels, such as gas, electricity, oil, solid fuel and LPG boilers. Each fuel has a varying cost associated with it which means you might find yourself with less costly energy bills by altering how your household is heated. Even solar thermal panels are being considered by many people as a way to reduce heating bills for the many years to come.